Silverchairwere an Australian rock band, which formed in 1992 as Innocent Criminals in Merewether, Newcastle with the line-up of Ben Gillies on drums, Daniel Johns on vocals and guitars, and Chris Joannou on bass guitar. The group got their big break in mid-1994 when they won a national demo competition conducted by SBS TV show Nomad and ABC radio station, Triple J. The band was signed by Murmur, and were successful on the Australian and international rock stages. Merewether is a suburb of Newcastle, New South Wales, Australia, located 3 km (2 mi) from Newcastle's central business district with a population of around 11,000. The suburb stretches 3 km (2 mi) from Merewether Beach in the east to Adamstown in the west. The APRA Music Awards are several award ceremonies run in Australia by Australasian Performing Right Association (APRA) and Australasian Mechanical Copyright Owners Society (AMCOS) to recognise composing and song writing skills, sales and airplay performance by its members annually. These awards are to honour achievements by composers and songwriters, and include the APRA Music Awards, the ART Music Awards and the Screen Awards, all in Australia. 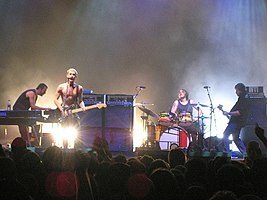 Silverchair's alternative rock sound had evolved throughout their career, differing styles on specific albums steadily growing more ambitious over the years, from grunge on their debut to more recent work displaying orchestral and art rock influences. The songwriting and singing of Johns had evolved steadily while the band had developed an increased element of complexity. In 2003, following the release of Diorama, the band announced a hiatus, during which time members recorded with side projects The Dissociatives, The Mess Hall, and Tambalane. Silverchair were reunited at the 2005 Wave Aid concerts. In 2007, they released their fifth album, Young Modern , and played the Across the Great Divide tour with contemporaries Powderfinger. In May of 2011, Silverchair announced an indefinite hiatus. As of January 2019, Silverchair have sold over 10 million albums worldwide. Grunge is a rock music genre and subculture that emerged during the mid-1980s in the Pacific Northwest U.S. state of Washington, particularly in Seattle and nearby towns. The early grunge movement revolved around Seattle's independent record label Sub Pop and the region's underground music scene. By the early 1990s its popularity had spread, with grunge bands appearing in California, then emerging in other parts of the United States and in Australia, building strong followings and signing major record deals. Benjamin David Gillies is an Australian musician, best known as the drummer of Australian rock band Silverchair from 1992 until the band went on hiatus in 2011. In 2003, Gillies formed Tambalane with Wes Carr, initially as a song-writing project, they released a self-titled album in 2005 and toured Australia but subsequently folded. By June 2011, after Silverchair's disbandment, Gillies was in the final stages of about 12 months of working on his solo album and he said that it was not a continuation of his earlier work with Tambalane. In 2012, he formed Bento, in which he performs lead vocals, and released the band's debut album Diamond Days. Daniel Paul Johns is an Australian musician, singer, and songwriter. Best known as the former front man of the rock band Silverchair, Johns is also one half of The Dissociatives with Paul Mac and, in 2007, was ranked at number 18 on Rolling Stone's list of The 25 Most Underrated Guitarists. Newcastle High School is a state run high school located in Newcastle West—a suburb of Newcastle, New South Wales, Australia–with an enrolment of approximately 1100 students. Triple J is a government-funded, national Australian radio station intended to appeal to listeners of alternative music, which began broadcasting in January 1975. The station also places a greater emphasis on broadcasting Australian content compared to commercial stations. Triple J is a division of the Australian Broadcasting Corporation. Murmur was a record label that started as an imprint of Sony Music Australia in mid-1994. Named after R.E.M. 's first album, Murmur signed a number of Australia's most successful rock bands, including Silverchair, Ammonia, Something for Kate and Jebediah. Notable alumni of Murmur include John O'Donnell, a former Rolling Stone journalist who became the head of EMI Australia, and John Watson, who runs a music management company and independent record label Eleven. Sydney Morning Herald's music writer, Bernard Zuel, said the band's use of "indefinite hibernation" was a way to soften the blow of the group's break-up for fans; he expected future reunions and performances for worthy causes. By June, Gillies was in the final stages of about 12 months of working on his solo album and he said that it was not a continuation of his earlier work with Tambalane. In October, Johns was working on the soundtrack for My Mind's Own Melody – a short film. In May 2012 Johns recorded the new anthem for Qantas titled 'Atlas.' It is the first piece of commercial music Johns has composed. The Dissociatives are an Australian band consisting of Daniel Johns of Silverchair, Australian dance producer DJ Paul Mac, and touring members Julian Hamilton and Kim Moyes from Sydney electronic duo "The Presets". Their first single "Somewhere Down the Barrel" was released in March 2004 and peaked at number 25. The debut album The Dissociatives was released on 4 April 2004. Frogstomp is the debut studio album by Australian alternative rock band Silverchair. It was released on 27 March 1995, when the members were only 15 years of age, by record label Murmur. Neon Ballroom is the third studio album by Australian alternative rock band Silverchair, released in 1999 by record labels Murmur and Epic. 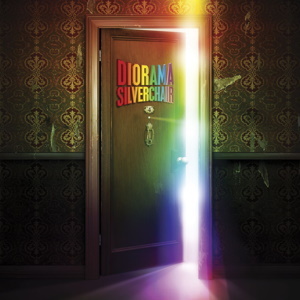 Diorama is the fourth studio album by Australian alternative rock band Silverchair, released on 31 March 2002 by Atlantic/Eleven. It won the 2002 ARIA Music Award for Best Group and Best Rock Album. The album was co-produced by Daniel Johns and David Bottrill. While Bottrill had worked on albums for a variety of other bands, Diorama marked the first production credit for lead singer Johns. Live from Faraway Stables is a 2003 live album and concert film by Australian alternative rock band Silverchair. It was recorded at their concert held on 19 April 2003, at Newcastle Civic Theatre in the band's home-town of Newcastle, New South Wales, Australia, and was the second show to be held there during the band's Across the Night world tour of March to June 2003. It is Silverchair's first live release. The Best of Vol. 1 is a greatest hits collection by Australian alternative rock band, Silverchair, which was issued on 13 November 2000. It includes every single they had released up until that point, except "Shade". The album peaked at No. 15 on the ARIA Albums Chart. "Tomorrow" is a song by Australian rock band Silverchair which was released on 16 September 1994 on their debut extended play album, also titled Tomorrow. The song also appeared on the band's first full-length album, Frogstomp. It won the 1995 ARIA Music Award for Single of the Year and Highest Selling Single. The track was written by the band's lead vocalist, lead guitarist and front man, Daniel Johns, and their drummer-percussionist, Ben Gillies. It was produced and engineered by Phil McKellar at national radio station, Triple J's studios for SBS-TV's show, Nomad, which aired on 16 June 1994. After the broadcast the band were signed to the Murmur label – a Sony Music subsidiary – which subsequently issued the Tomorrow EP. "Without You" is the second single released on 13 May 2002 by Australian rock band Silverchair from their fourth album, Diorama, issued in March that year. It was written in Db major by lead singer-guitarist Daniel Johns and was composed during the recording sessions for the band's third album Neon Ballroom (1999) but was not used at that time. "Ana's Song " is an alternative rock song by Australian group Silverchair which was released in May 1999 as the second single from their third album, Neon Ballroom. The track earned Silverchair a Comet Award in Germany. "Israel's Son" is a song by Australian rock band Silverchair, released in 1995. It was the third single released from their debut full-length album, Frogstomp, which was released earlier the same year. It was also released on their The Best of Volume 1, and used on the soundtrack to the western version of Street Fighter II: The Animated Movie. The Across the Great Divide Tour was a live DVD and release by Australian rock bands Powderfinger and Silverchair. Released on 1 December 2007, it followed two Melbourne concerts during the bands' two-month-long nationwide tour, titled the Across the Great Divide tour. The DVD was produced by filming company PVC Live, who have produced DVD releases for U2, Red Hot Chili Peppers and Radiohead. It was mixed in the United States in 5.1 surround sound, and filmed with 24 cameras. The Ninth Australian Recording Industry Association Music Awards was held on 20 October 1995 at the Sydney Convention & Exhibition Centre. There had been a 19-month gap since the previous award ceremony which was moved to be "closer to the business end of the music industry's year". Presenters distributed 28 awards from 1060 preliminary nominations. Big winners for the year were Silverchair with five awards and Tina Arena with four, including Album of the Year and Song of the Year. The 13th Australian Recording Industry Association Music Awards was held on 12 October 1999 at the Sydney Entertainment Centre. Hosted by Paul McDermott and Bob Downe, and presenters, including Mel C of the Spice Girls, Tina Cousins, Fiona Horne and former Countdown host Ian "Molly" Meldrum, distributed 28 awards with the big winner for the year being Powderfinger with four awards. 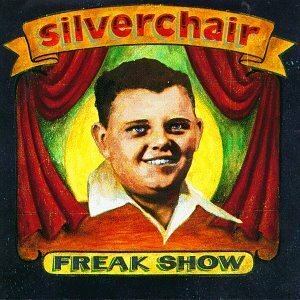 Freak Show is the second studio album by Australian alternative rock band Silverchair. It was recorded between May and November 1996 and released on 4 February 1997 by record labels Murmur and Epic. It was nominated for the 1997 ARIA Music Award for Best Group, but lost to Savage Garden. McFarlane, Ian (1999). "Whammo Homepage". Encyclopedia of Australian Rock and Pop . St Leonards, NSW: Allen & Unwin. ISBN 1-86508-072-1. Archived from the original on 5 April 2004. Retrieved 1 October 2011. Note: Archived [on-line] copy has limited functionality. 1 2 3 Carr, Matt (26 May 2011). "Silverchair take "indefinite" Break". The Newcastle Herald . Fairfax Media. Archived from the original on 12 October 2011. Retrieved 12 October 2011. 1 2 Munro, Kelsey (1 April 2006). "Escape Act". Rolling Stone (Australia). ACP Magazines. Archived from the original on 12 October 2011. Retrieved 13 October 2011. 1 2 3 4 5 6 7 8 9 10 11 12 13 14 15 16 17 18 19 20 21 McFarlane, 'silverchair' entry. Archived from the original on 19 April 2004. Retrieved 1 October 2011. 1 2 3 4 5 6 7 8 9 10 11 Erlewine, "Silverchair > Biography". 1 2 3 4 5 6 7 8 9 Nimmervoll, Ed. "Silverchair". HowlSpace – The Living History of Our Music. White Room Electronic Publishing Pty Ltd. Archived from the original on 13 October 2011. Retrieved 13 October 2011. 1 2 3 4 "Silverchair". Music Australia. National Library of Australia. 10 April 2003. Archived from the original on 13 October 2011. Retrieved 13 October 2011. ↑ "Past performers". YouthRock. Archived from the original on 22 April 2008. Retrieved 3 February 2008. 1 2 3 4 5 6 Jenkins, Jeff; Meldrum, Ian (2007). Molly Meldrum presents 50 years of rock in Australia. Melbourne, Vic: Wilkinson Publishing. pp. 86, 231, 261–262. ISBN 978-1-921332-11-1. ↑ "Interview with Silverchair". Buzz Magazine. 1 September 1994. Archived from the original on 13 December 2010. Retrieved 1 October 2011. ↑ Harmsworth, Andrei (26 May 2011). "Silverchair Announce Split Because 'Being in a Band Is No Fun Anymore'". Metro. Daily Mail . Associated Newspapers. Archived from the original on 12 October 2011. Retrieved 12 October 2011. ↑ Sennett, Sean; Groth, Simon, eds. (2010). "Silverchair – No Complaints from the 'Chair". Off the Record: 25 Years of Music. Brisbane, QLD: University of Queensland Press. pp. 223–224. ISBN 978-0-7022-3863-5. ↑ "silverchair Speak Out!". Smash Hits . EMAP Limited. January 1995. Archived from the original on 13 February 2003. Retrieved 1 October 2011. 1 2 3 4 Spencer, et al. 1 2 3 4 5 6 7 8 9 Hung, Steffen. "Silverchair Discography". Australian Charts Portal. Hung Medien. Archived from the original on 13 October 2011. Retrieved 13 October 2011. ↑ Hung, Steffen. "Silverchair – "Tomorrow"". Australian Charts Portal. Hung Medien. Archived from the original on 13 October 2011. Retrieved 13 October 2011. 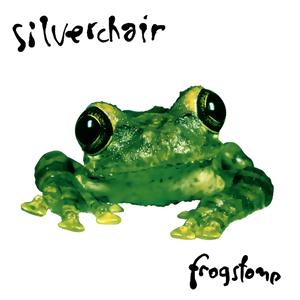 1 2 3 4 "Silverchair: Frogstomp". Rolling Stone. Jann Wenner. 2 February 1998. Archived from the original on 6 July 2007. Retrieved 13 February 2008. 1 2 3 4 Erlewine, Stephen Thomas. "Frogstomp > Review". Allmusic (Rovi Corporation). Archived from the original on 14 October 2011. Retrieved 14 October 2011. ↑ "Kevin Shirley > Credits". Allmusic (Rovi Corporation). Archived from the original on 13 October 2011. Retrieved 13 October 2011. ↑ "That's the Breaks, Keanu". Chicago Tribune . Tribune Company (Tony W. Hunter). 24 December 1996. Archived from the original on 13 October 2011. Retrieved 14 October 2011. ↑ "Silverchair Perform As "Short Elvis" in Concert at the Gaelic Theatre in Sydney – March 16, 2006". WireImage (Getty Images). 16 March 2006. Archived from the original on 13 October 2011. Retrieved 14 October 2011. ↑ Hung, Steffen. "Silverchair – Frogstomp". Australian Charts Portal. Hung Medien. Archived from the original on 14 October 2011. Retrieved 14 October 2011. 1 2 "Gold and Platinum – Silverchair". RIAA. Archived from the original on 16 December 2012. Retrieved 17 February 2008. ↑ "Canadian Certifications – Silverchair". Music Canada. 14 October 2011. Archived from the original on 14 October 2011. ↑ Danaher, Michael (4 August 2014). "The 50 Best Grunge Songs". www.pastemagazine.com. Paste. Retrieved 8 February 2017. ↑ "Artist :: Silverchair". Australian Music Online. Archived from the original on 31 July 2008. Retrieved 12 March 2008. 1 2 "Teen Sentenced to 65 Years for His Part in Murders". Kitsap Sun . E. W. Scripps Company (Charles D Horton III). 22 February 1996. Archived from the original on 14 October 2011. Retrieved 15 October 2011. 1 2 "Attorney wants to open teen's murder trial with rock song". Seattle Post-Intelligencer . Hearst Corporation. 18 January 1996. Archived from the original on 17 May 2011. Retrieved 15 October 2011. 1 2 Elliott, Paul (1997). "Roo Fighters". Kerrang! . Bauer Media Group. Archived from the original on 14 October 2011. Retrieved 15 October 2011. ↑ Wooldridge, Simon (February 1997). "Freak Show Review". Juice. ↑ "ARIA Charts – Accreditations – 1997 Albums". Australian Recording Industry Association (ARIA). Archived from the original on 14 October 2011. Retrieved 15 October 2011. ↑ "silverchair". rage . Australian Broadcasting Corporation (ABC). 4 September 1999. Archived from the original on 14 October 2011. Retrieved 15 October 2011. 1 2 3 4 Richard, Kingsmill (29 November 2000). "Daniel Johns of silverchair speaks to Richard Kingsmill". Triple J (Australian Broadcasting Corporation (ABC)). Archived from the original on 29 January 2009. Retrieved 4 October 2011. ↑ "Silverchair > Charts & Awards > Billboard Albums". Allmusic (Rovi Corporation). Archived from the original on 14 October 2011. Retrieved 15 October 2011. ↑ Roberts, David, ed. (2006). British Hit Singles & Albums (19th ed.). HIT Entertainment. ISBN 1-904994-10-5. 1 2 "Silverchair > Charts & Awards > Billboard Singles". Allmusic (Rovi Corporation). Archived from the original on 14 October 2011. Retrieved 15 October 2011. 1 2 3 4 5 O'Donnell, John; Creswell, Toby; Mathieson, Craig (October 2010). "25: Silverchair – Neon Ballroom". 100 Best Australian Albums . Prahran, Vic: Hardie Grant Books. pp. 90–91. ISBN 978-1-74066-955-9. ↑ Fisher, Blair R (11 July 1999). "Silverchair Frontman Reveals Battle with Anorexia". Rolling Stone . Jann Wenner. Archived from the original on 30 January 2009. Retrieved 4 October 2011. ↑ Sams, Christine (6 June 2004). "Anorexia almost killed me: Daniel Johns". Sydney Morning Herald . Fairfax Media. Archived from the original on 14 October 2011. Retrieved 15 October 2011. 1 2 Chonin, Neva (18 March 1999). 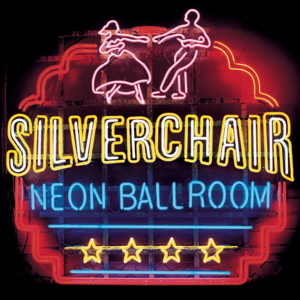 "Silverchair: Neon Ballroom". Rolling Stone. Jann Wenner. Archived from the original on 6 July 2007. Retrieved 5 February 2008. ↑ Young, Daniel (29 August 1999). "Reading Festival – Reading, UK". Silverchair. Archived from the original on 15 October 2011. Retrieved 15 October 2011. 1 2 3 "Band: silverchair – Stories and Highlights". Long Way to the Top . Australian Broadcasting Corporation (ABC). 2001. Archived from the original on 15 October 2011. Retrieved 15 October 2011. ↑ Thomas, Les. "Silverchair, The Falls Festival, Lorne, Victoria, 31/12/00". Massive Magazine. Silverchair. Archived from the original on 15 October 2011. Retrieved 15 October 2011. 1 2 "Silverchair Signs with Eleven: Eleven signs with EMI". Silverchair. Archived from the original on 15 October 2011. Retrieved 15 October 2011. ↑ Farinella, David John (1 January 2003). "Silverchair's Diorama album – recording the new Silverchair rock CD". Mix . Penton Media. Archived from the original on 15 October 2011. Retrieved 15 October 2011. 1 2 Claire (2009). "Diorama". RollerCoaster . Australian Broadcasting Corporation (ABC). Archived from the original on 15 October 2011. Retrieved 15 October 2011. ↑ Neilsen, Mark (22 April 2002). "Another Point of View". Drum Media . 1 2 Tranter, Nikki (6 September 2002). "Silverchair: Diorama". PopMatters. Sarah Zupko. Archived from the original on 23 April 2009. Retrieved 8 February 2008. ↑ "Diorama – Silverchair > Credits". Allmusic (Rovi Corporation). Archived from the original on 15 October 2011. Retrieved 15 October 2011. ↑ Kemp, Mark (8 August 2002). "Silverchair: Diorama". Rolling Stone (902). Archived from the original on 10 July 2007. Retrieved 6 October 2011. ↑ "Great Australian Albums:Diorama – Silverchair". Dymocks. Archived from the original on 15 October 2011. Retrieved 15 October 2011. ↑ "Press – Sydney, Australia (Big Day Out)". Chairpage.com (Silverchair). 26 January 2002. Archived from the original on 15 October 2011. Retrieved 15 October 2011. ↑ "Dr Kerryn Phelps, Health Editor, with Steve Leibmann, Channel Nine, Today". Australian Medical Association. 6 May 2002. Archived from the original on 12 October 2011. Retrieved 12 October 2011. ↑ "Daniel Johns wows fans with buff bod". Nine News . NineMSN (Nine Entertainment Co., Microsoft). 6 August 2007. Archived from the original on 12 October 2011. Retrieved 12 October 2011. ↑ Hung, Steffen. "Silverchair – Diorama". Australian Charts Portal. Hung Medien. Archived from the original on 12 October 2011. Retrieved 12 October 2011. 1 2 3 4 5 "Winners by artist: Silverchair". Australian Recording Industry Association (ARIA). Archived from the original on 10 February 2009. Retrieved 1 October 2011. ↑ "Silverchair to Bring Diorama Alive at ARIAs". Silverchair. 12 October 2002. Archived from the original on 15 October 2011. Retrieved 16 October 2011. 1 2 MacNeil, Jason (13 July 2007). "Silverchair makes most of break". JAM! Music (CANOE (Quebecor Media)). Archived from the original on 15 October 2011. Retrieved 16 October 2011. 1 2 3 "Silverchair". Music Australia. National Library of Australia. 3 April 2007. Archived from the original on 16 October 2011. Retrieved 16 October 2011. ↑ "The Dissociatives". Triple J (Australian Broadcasting Corporation (ABC)). 2 April 2004. Archived from the original on 16 October 2011. Retrieved 16 October 2011. ↑ "About the Program – Credit List (08/12/2010)". Spicks and Specks . Australian Broadcasting Corporation (ABC). 8 December 2010. Archived from the original on 17 October 2011. Retrieved 17 October 2011. ↑ O'Brien, Jon. "Counting Down the Days – Natalie Imbruglia – Review". Allmusic (Rovi Corporation). Archived from the original on 17 October 2011. Retrieved 17 October 2011. ↑ "Releases :: Feeling Sideways". Australian Music Online. Archived from the original on 8 June 2008. Retrieved 6 October 2011. ↑ "Awards by artist: The Mess Hall". Australian Record Industry Association. Archived from the original on 11 June 2008. Retrieved 9 February 2008. ↑ "Notes From A Ceiling". Australian Music Online. 2005. Archived from the original on 9 September 2006. Retrieved 31 May 2006. ↑ "ARIA Awards – History: Winners by Year 2005: 19th Annual ARIA Awards". Australian Recording Industry Association (ARIA). Retrieved 6 October 2011. ↑ "Tambalane". Australian Music Online. Archived from the original on 21 May 2008. Retrieved 6 October 2011. ↑ Yates, Rod (30 October 2007). "Silverchair's Daniel Johns tells of his musical journey". PerthNow. The Sunday Times . News Limited (News Corporation). Archived from the original on 28 October 2008. Retrieved 12 March 2008. ↑ Munro, Kelsey (1 December 2006). "Homecoming Heroes". Sydney Morning Herald. Fairfax Media. Archived from the original on 17 October 2011. Retrieved 17 October 2011. 1 2 Erlewine, Stephen Thomas; Leahey, Andrew. "Silverchair". Billboard . Prometheus Global Media . Retrieved 17 October 2011. ↑ "Young modern / Silverchair ;". catalogue. National Library of Australia. Archived from the original on 17 October 2011. Retrieved 17 October 2011. ↑ "ARIA Awards – History: Winners by Year 2006: 20th Annual ARIA Awards". Australian Recording Industry Association (ARIA). Retrieved 6 October 2011. ↑ Sams, Christine (6 November 2006). "Your access-all ARIAs pass". Sydney Morning Herald. Fairfax Media. Archived from the original on 17 October 2011. Retrieved 18 October 2011. ↑ "Obama Recruits Kanye West, Arcade Fire Let Loose". Channel V. Archived from the original on 11 June 2008. Retrieved 12 March 2008. ↑ "Silverchair Make Chart History". DIG Radio . Australian Broadcasting Corporation (ABC). 12 April 2007. Archived from the original on 17 October 2011. Retrieved 18 October 2011. ↑ Rod Yates (30 October 2007). "Silverchair's Daniel Johns tells of his musical journey". PerthNow . news.com.au. Archived from the original on 28 October 2008. Retrieved 27 April 2008. 1 2 Tedeschi, Claire (2007). "Across the Great Divide for Reconcile.org.au" (PDF). Reconciliation Australia. Archived from the original (PDF) on 13 April 2008. Retrieved 18 October 2011. 1 2 Dunn, Emily (13 June 2007). "In concert – rock and reconciliation". Brisbane Times . Fairfax Media. Archived from the original on 17 October 2011. Retrieved 18 October 2011. 1 2 "ARIA Awards – History: Winners by Year 2007: 21st Annual ARIA Awards". Australian Recording Industry Association (ARIA). Archived from the original on 18 November 2007. Retrieved 6 October 2011. 1 2 3 Adams, Cameron (17 June 2008). "Silverchair's Straight Lines wins top APRA award". Herald Sun. News Corporation. Archived from the original on 20 June 2008. Retrieved 19 June 2008. ↑ "ARIA Awards – History: Winners by Year 2008: 22nd Annual ARIA Awards". Australian Recording Industry Association (ARIA). Retrieved 6 October 2011. ↑ Daniel Johns (interviewee), Robbie Buck, Marieke Hardy, Lindsay "The Doctor" McDougall (interviewers) (3 December 2009). Daniel Johns on the New Silverchair Album. Robbie, Marieke and The Doctor. Triple J (Australian Broadcasting Corporation (ABC)). Event occurs at 2:48. Archived from the original on 17 October 2011. Retrieved 18 October 2011. 1 2 Ruckus, Eddie (14 May 2010). "Silverchair's Controversial New Sound". Rock News. Triple M (Triple M Network (Austereo Radio Network)). Archived from the original on 18 October 2011. Retrieved 18 October 2011. ↑ "Chairpage News: Silverchair News". Silverchair Official Website. 25 May 2011. Archived from the original on 6 October 2011. Retrieved 7 October 2011. ↑ "Silverchair lose their spark, but deny split". 1233 ABC Newcastle (Australian Broadcasting Corporation (ABC)). 26 May 2011. Archived from the original on 18 October 2011. Retrieved 18 October 2011. ↑ Lau, Kristie (12 June 2011). "Silverchair drummer works on solo album". Sydney Morning Herald. Fairfax Media. Archived from the original on 18 October 2011. Retrieved 18 October 2011. ↑ Halliwell, Elle (1 October 2011). "New Spice to Life for Daniel Johns". The Sunday Telegraph . News Limited (News Corporation). Archived from the original on 18 October 2011. Retrieved 18 October 2011. ↑ "Could A Silverchair Reunion Be In The Works?". Take 40. 27 October 2012. Archived from the original on 30 November 2012. Retrieved 4 August 2013. ↑ "Silverchair Bass Player Chris Joannou Says That A Reunion Isn't Off The Cards". Take 40. 15 January 2013. Archived from the original on 21 April 2014. Retrieved 4 August 2013. ↑ "Silverchair Have Half-Finished Album Says Drummer, Reunion Will Happen". Tone Deaf. 26 October 2012. Retrieved 17 October 2015. 1 2 3 Bolger, Clayton. "Young Modern > Review". Allmusic (Rovi Corporation). Archived from the original on 18 October 2011. Retrieved 19 October 2011. ↑ "Quick Silverchair Messenger". Rolling Stone. 27 December 1996. Archived from the original on 8 June 2008. Retrieved 18 March 2008. ↑ Howitt, Bernie. Focus Study: Grunge. NSW HSC Online (Thesis). Charles Sturt University. Archived from the original on 13 October 2011. Retrieved 13 October 2011. 1 2 3 Brownlee, Clint (18 July 2007). "Seattlest Interview: Silverchair Drummer Ben Gillies". Seattlest. Gothamist LLC. Archived from the original on 18 October 2011. Retrieved 19 October 2011. ↑ "Episode 6: Gathering of the Tribes 1984–2000". Long Way to the Top. Australian Broadcasting Corporation (ABC). 2001. Archived from the original on 18 October 2011. Retrieved 19 October 2011. ↑ Torreano, Bradley. "Diorama – Silverchair". Allmusic (Rovi Corporation). Archived from the original on 18 October 2011. Retrieved 18 October 2011. ↑ Zuel, Bernard (12 April 2003). "Silverchair, State Theatre". Sydney Morning Herald. Fairfax Media. Archived from the original on 18 October 2011. Retrieved 19 October 2011. ↑ Broadley, Erin (16 August 2007). "Interviews > Daniel Johns of Silverchair". SuicideGirls. Archived from the original on 27 September 2010. Retrieved 19 October 2011. ↑ Follos, Tim (24 July 2007). "Young Moderns: Silverchair". Express . The Washington Post Company. Archived from the original on 18 October 2011. Retrieved 19 October 2008. ↑ Bolling, Stephanie. "Silverchair: Interview with Chris Joannou". reax. Archived from the original on 10 October 2008. Retrieved 16 February 2008. ↑ "APRA Music Awards – 2008 Nominations". Australasian Performing Right Association. Archived from the original on 15 June 2008. Retrieved 19 June 2008. ↑ Erlewine, Stephen Thomas. "Freak Show > Overview". Allmusic (Rovi Corporation). Archived from the original on 18 October 2011. Retrieved 19 October 2011. ↑ Masuo, Sandy (12 April 1997). "Freak Show". Yahoo! Music. Archived from the original on 4 December 2008. Retrieved 19 October 2011. ↑ Ali, Lorraine (27 January 1997). "Freak Show | Album Reviews". Rolling Stone. Jann Wenner. Archived from the original on 19 October 2011. Retrieved 19 October 2011. ↑ Zuel, Bernard (3 April 1997). "Men at Work, Boys at Play". Metro. Sydney Morning Herald. Fairfax Media. p. 4. Archived from the original on 19 October 2011. Retrieved 19 October 2011. 1 2 Lanham, Tom (19 March 1999). "Neon Ballroom | Music Review". Entertainment Weekly . Time Warner. Archived from the original on 19 October 2011. Retrieved 19 October 2011. ↑ Kemp, Mark (8 August 2002). "Silverchair: Diorama". Rolling Stone. Jann Wenner. Archived from the original on 10 July 2007. Retrieved 13 February 2008. 1 2 Pearson, Nick (22 May 2007). "Silverchair: Young Modern". PopMatters. Sarah Zupko. Archived from the original on 19 October 2011. Retrieved 19 October 2011. ↑ Everson, John (2 August 2007). "Foo Fighters, Silverchair, Sound the Alarm". The Star Newspapers (SouthtownStar). Sun-Times Media Group. Archived from the original on 19 October 2011. Retrieved 19 October 2011. ↑ "Silverchair – Young Modern CD Album". CD Universe (Muze Inc). 24 July 2007. Archived from the original on 19 October 2011. Retrieved 19 October 2011. ↑ "Countdown: Hottest 100 – Of All Time 31–40". Triple J (Australian Broadcasting Corporation (ABC)). July 2009. Archived from the original on 19 October 2011. Retrieved 19 October 2011. ↑ "ARIA Awards – History: Winners by Year 1995: 9th Annual ARIA Awards". Australian Recording Industry Association (ARIA). Archived from the original on 26 September 2007. Retrieved 6 October 2011. ↑ "Ben Gillies > Credits". Allmusic (Rovi Corporation). Archived from the original on 15 October 2011. Retrieved 16 October 2011. ↑ "Chris Joannou > Credits". Allmusic (Rovi Corporation). Archived from the original on 15 October 2011. Retrieved 16 October 2011. ↑ "Daniel Johns > Credits". Allmusic (Rovi Corporation). Archived from the original on 15 October 2011. Retrieved 16 October 2011. ↑ Cohen, Randy (30 March 1999). "Interview with Silverchair". Rock Publication. Rock Publication Inc. Archived from the original on 25 April 2012. Retrieved 7 October 2011. ↑ "Paul Mac > Credits". Allmusic (Rovi Corporation). Archived from the original on 15 October 2011. Retrieved 16 October 2011. ↑ "Julian Hamilton > Credits". Allmusic (Rovi Corporation). Archived from the original on 15 October 2011. Retrieved 16 October 2011. "If You Keep Losing Sleep"